Take an interest product Click here for contact us. 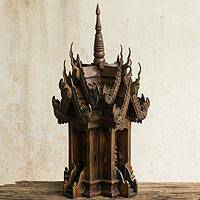 Mostly, teak has been used for carving as, unlike nowadays, it used to grow in abundance in Thailand. 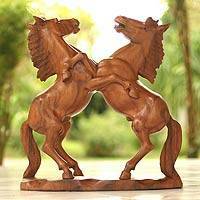 Besides, it has the right quality for the purposes, being fairly soft and tough, which makes it easy to carve in various beautiful, deep and sharp patterns. Its natural wood grain is also attractive. When painted or decorated with lacquer-gilded design, teakwood can quickly absorb the solutions. 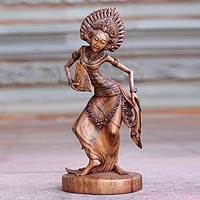 Wood-carving is done in two styles bas-relief and free-standing both of which require similar steps of carving. Firstly, the carver sketches what he wants to carve on a piece of wood. Then he uses iron tools like a chisel and a hammer to cut and shape it accordingly. The work requires great care and patience as damage can easily occur. The next step is to carve smaller, more detailed patterns with accordingly smaller tools. The completely-carved wood may then be painted, lacquered or gilded as desired. 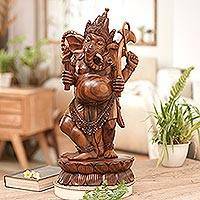 Wood carving is a form of working wood by means of a cutting tool held in the hand (this may be a power tool), resulting in a wooden figure or figurine (this may be abstract in nature) or in the sculptural ornamentation of a wooden object. The phrase may also refer to the finished product, from individual sculptures, to hand-worked mouldings composing part of a tracery. Everybody knows that woodcarving is easy; you start with a big enough plank or log, and you visualize inside it the shape you want. Then you just chip away all the extra wood. Easy as pie. The carver's art lies in knowing how to remove only that unwanted wood, and not a sliver more, for once it's gone you can't glue it back. You can get somewhere the first time you try it, then you can spend the rest of your life acquiring mastery. Thai sculptors of the past concentrated almost exclusively on Buddha images, producing works that rank among the world's greatest expressions of Buddhist art. These have ranged in size from Sukhothai's gigantic seated Buddha at Wat Si Chum, which measures 11 metres from knee to knee, to tiny, fingernail-sized Buddhas worn as amulets. Their greatest achievements were during the Sukhothai period, when the smoothness and sheen of cast metals perfectly matched the graceful elongated simplicity of the basic form. To emphasize the spiritual qualities of Buddhism, Thai sculptors eschewed anatomical details such as muscles and bone structure, realizing that these would only distract from the enigmatic serenity that was their goal. Thai sculpture received a boost in 1933 when an Italian sculptor, Corado Feroci founded the Fine Arts School which in 1943 became Silpakorn University. Having first arrived in Thailand in 1924 to work with the Royal Fine Arts Department on the creation of monumental sculptures, Feroci is today remembered as the father of modern art in Thailand. He became a Thai citizen in 1944, changing his name to Silpa Bhirasri, and served as Dean of the Painting and Sculpture Faculty until his death in 1962. Many of his students have been awarded with the "National Artist" status. These include, for example, Paitoon Muangsoomboon, Chit Rianpracha and Pimarn Moolpramook whose works have appeared in various places such as at the Benjasiri Gardens in Bangkok. Another artist who well-known among the Thais and abroad is Misiem Yip-in-tsoi.